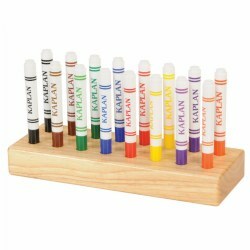 Help students develop their fine motor skills as well as their creative spark with Kaplan's extensive collection of markers. 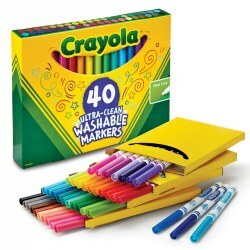 Products include washable and dry erase markers in a variety of sizes and colors. 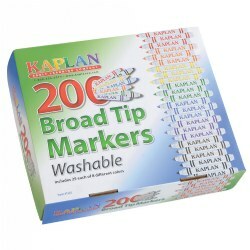 Kaplan also offers Do-A-Dot markers, multicultural broad tip markers, fine tip markers, and marker stands. 3 years & up. 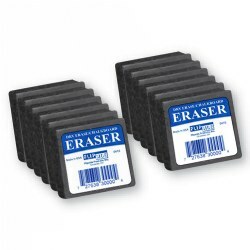 Easy to use--just twist off the cap and create hundresds of art projects. Includes idea sheet and six brilliant colors: pink, violet, teal, sunflower yellow, lime green, and pink. Non-toxic. 2 1/2 oz. each. Made in the USA. 3 years & up. 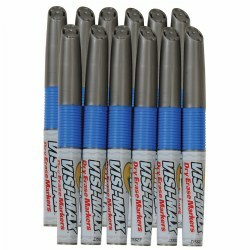 The Crayola® Visi-Max Dry-Erase Markers are perfect for classroom or home use with bold colors and smooth and crisp lines every time. 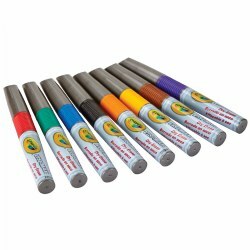 Eight broad line dry erase chisel tip markers in assorted colors. 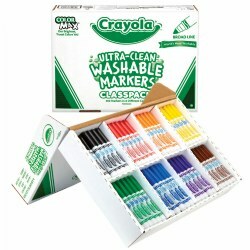 Crayola® Classic color markers wash from skin and most fabrics, inviting creativity and reducing clean-up. Made in the USA. Choose 8-count or 12-count package. 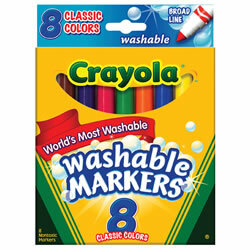 8 Crayola® Bold color markers wash from skin and most fabrics, inviting creativity and reducing clean-up. This rugged wooden stand holds 16 markers neatly. Measures 11"L x 4"W. Markers are not included. No cups, no brushes, just twist off the top and design with dots! 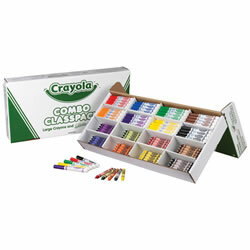 Set of 5 colors including purple, green, yellow, orange and pink. 2 1/2 oz. each. Made in the USA. 3 years & up. 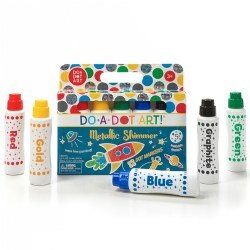 You can paint, dot and doodle with this set of easy flow painters. No cups, brushes, or clean-up necessary. Just twist off the cap and let your creative juices flow! Colors include diamond pink, ruby red, golden yellow, emerald green, sapphire blue, and onyx black. Non-toxic. Made in the USA. 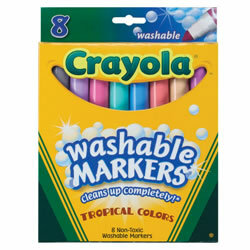 8 Crayola® Tropical color markers wash from skin and most fabrics, inviting creativity and reducing clean-up. Made in the USA. Rich, radiant and shiny! 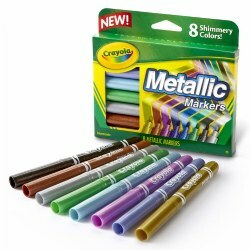 Crayola® Metallic Markers add an extra sleek sheen to homemade cards, crafts, and colorful art projects. Eight steely tones to choose from: Black Iron, Copper Mine, Slick Silver, Green Machine, Cobalt Blue, Pink Bling, Purple Steel, and Gold Ingot. Personalize t-shirts, bags and other fabric crafts without the use of messy dyes. 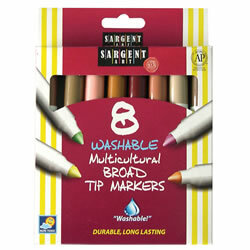 The durable and long lasting, brightly colored markers are easy to use and easy to set. 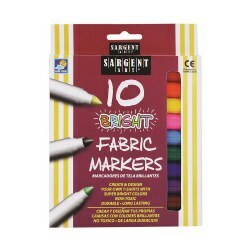 Set of ten markers in ten different colors. 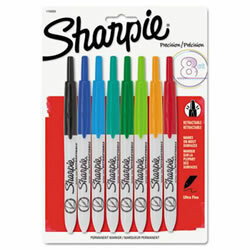 This Sharpie marker set is quick-drying and nontoxic. 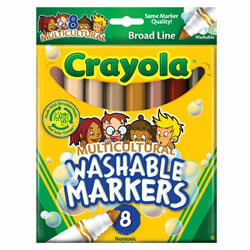 Includes 8 assorted colors. Precise, fine point tip with easy one-handed advancing and retracting; no cap to remove. 3 years & up. No Cups, no brushes, no mess! 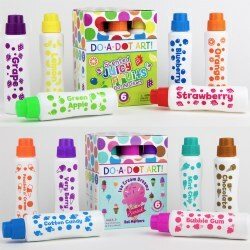 These colorful, scented Do-A-Dot markers feature a twist-off-the-top design, a sponge-tip applicator, and a variety of invigorating scents like fruit and ice cream. 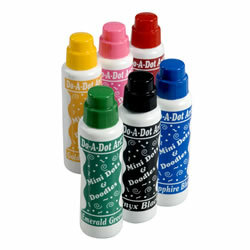 Now you can make beautiful dot art designs that smell as good as they look. Just don't eat it when you're finished! 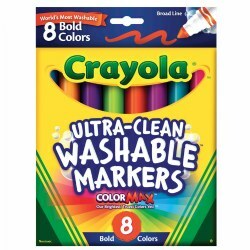 Each pack includes 6 scented markers. Choose between Juicy Fruit flavor scents or Ice Cream flavor scents. 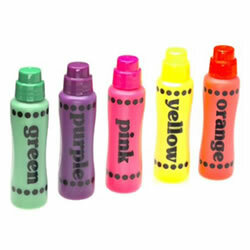 These low odor, bold markers provide smooth writing on any write-on/wipe-off surface. 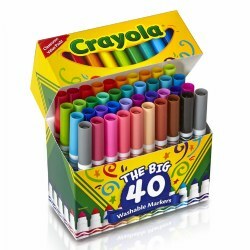 Box contains 12 markers of one color. Choose color. 3 years & up. 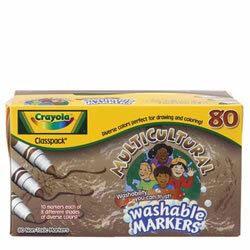 Reinvigorate your world with these bright Broad-line Washable Markers by Crayola®. Features classic markers in 40 different high-quality COLORMAX™ colors. Made from durable, non-toxic materials. 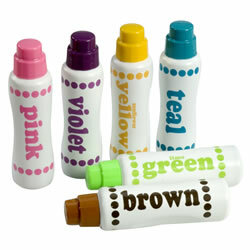 Markers wash out of most clothing, off of most walls, and off of skin (use water without added chemicals).